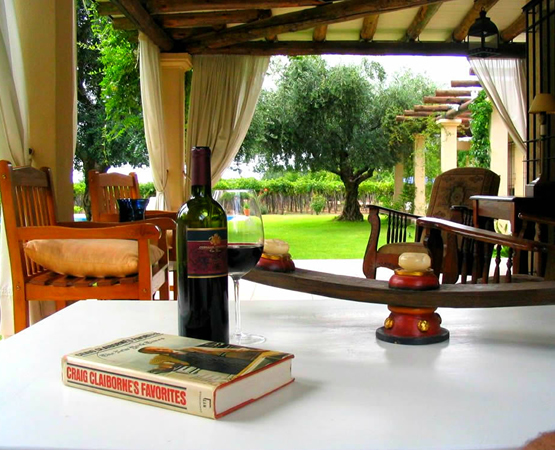 The House of "Conalbi Grinberg Casa Vinícola" has the dreamy air of Mendoza wineries. Soothing gardens well maintained, colorful galleries, and a beautiful Andean landscape hard to forget. This place is a trully "Mendocino" house of Mendoza, located in the countryside. 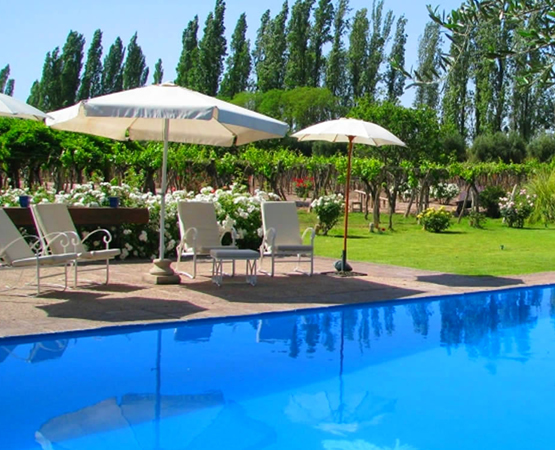 Not a hotel, is located in the wine and olive growing region of Mendoza. The house belongs to the winery Conalbi Grinberg Casa Vinicola one of the first boutique wineries in Argentina. The house is also used for cultural and social events. Here you can enjoy total privacy as there are only 2 rooms. No credit cards are accepted. Only cash dollars or pesos. In this beautiful house there are pets, 2 cats and 3 dogs that behave very well. The dogs do not enter the house, only cats. In the rooms there are not TV. There is air conditioning in one of the rooms and in the other ceiling fan... nights are cool and do not require the use of air conditioners. In the "Casa Vinícola Conalbi Grinberg" guests find a genuine exclusive, an interesting cuisine and rich environments ranked by watercolors and sculptures. 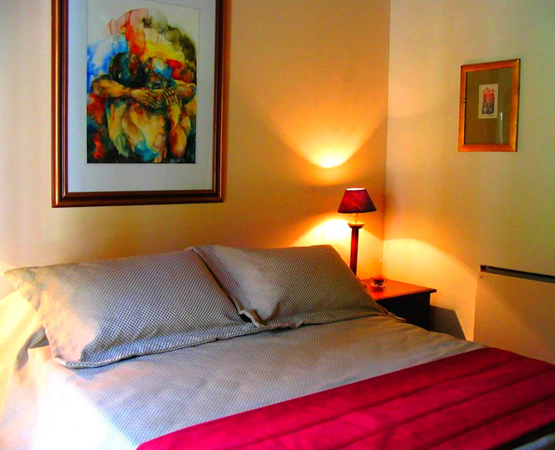 To live intimately the spirit of the wine house two comfortable rooms are arranged. Outside, you can walk through a beautiful park and delight the eye with a formidable Andean landscape cut only by the tortuous shape of the vines nearby. Guests are able to use all the facilities of the house as much as the living room, dining room, pool, gardens. (they are not only paying for the use of the room but are available throughout the house). Meals are not included in the stay but we can prepare any meal ordered in advance. Remember that there are pets in the house. The house has only 2 rooms with 2 twin beds (joined together) for 2 people each with en-suite and 1 bedroom with queen size bed with private bathroom but outside of the room. In the rooms there are not TV. There is air conditioning in one of the rooms and in the other a ceiling fan... the nights are cool and do not require the use of air conditioners. All rooms have a rate of USD 350 per night with breakfast and taxes included. In this house you can witness the special dedication and passion that characterizes the work of its people in the production and aging of wines. 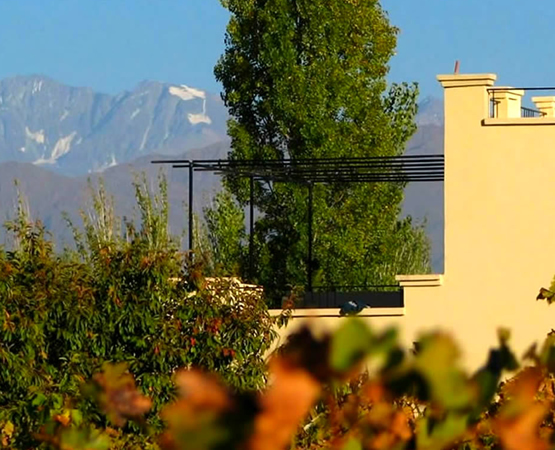 The winery produces premium wines in small scale, currently in the order of 14 thousand bottles of each of his 5 labels, all of pure varietals, uncut. The wine proccess takes place in the Carmina Granat Winery, with the advice of winemaker Burlan; they make under Conalbi Grinberg brand Merlot, Malbec, Cabernet Sauvignon and Ugni Blanc, all French oak aging, except the '99 Merlot. Conalbi Grinberg wines are handcrafted, with limited production of 6000 bottles of each variety. Real distinctions can be enjoyed as Argentina's wine industry, people leaving the captivating pleasure of exclusivity enjoyed a drink after one of gripping force, color, aroma and flavor. 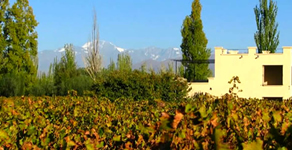 Vineyards: The Conalbi Grinberg vineyards are located in the province of Mendoza, in the major wine areas (Chacras de Coria, Las Compuertas, Lujan de Cuyo, Barrancas) where the wines are offered at its best. Activities: In the House you can participate of wine tasting, walk through the old grapevine as well as the shade of ancient olive trees. CONALBI GRINBERG WINERY IS NOT OPEN FOR VISITS. 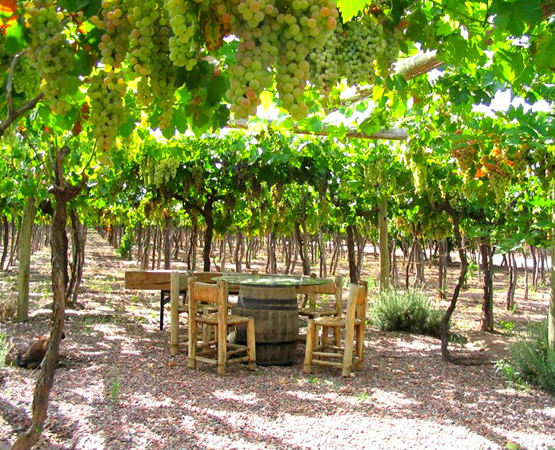 Activities nearby: Wine Tours, visits to olive oil factories, golf, horseback riding, etc. Conalbi Grinberg is located in Russell, Maipú Department in the province of Mendoza (Argentina). Get to the house is very easy. From the city of Mendoza, which is just twenty minutes, you have to pass through the Southern Access and, before the junction with Route 60, turn east on Boedo (by this artery, to the contrary, you get to Chacras de Coria), cross the railroad to Maza, and at 1848 you will find the entrance.